music / theatre @ Ilion Municipal Cultural Center "Melina Mercouri"
Ilion Municipal Cultural Center "Melina Mercouri"
Music performance for violin, cello and narrator by Maria Aloupi & Andreas Diktyopoulos based on the literary work Z213: EXIT from the Dimitris Lyakos' poetic trilogy Poena Damni. Two composers collaborate to create a single, unique piece of music respectively to the two narrators' recount of Z213: EXIT. 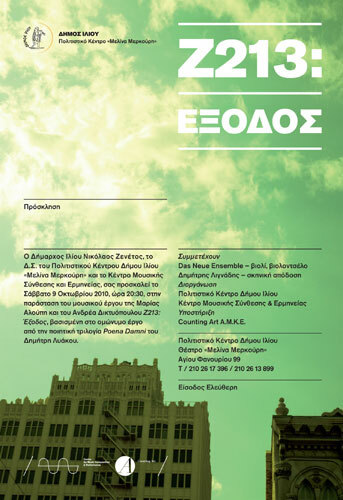 The original composition for violin, cello and narrator is based on the literary work Z213: EXIT from the Dimitris Lyakos' poetic trilogy Poena Damni.Inspired by the themes and issues of the book, the musical work adopts elements of form and structure from the poetic work. The narration which, conversing with the music emphasizes the discursive character of the Dimitris Lyakos' work, has been undertaken by the director and actor Dimitris Lignadis. Z213: EXIT marks the beginning of Dimitris Lyacos' poetic trilogy Poena Damni. Written over the course of seventeen years, in reverse order, the present publication sees the trilogy's completion. The last episode, The First Death, was the first to appear in 1996, followed by the second, Nyctivoe, in 2001. The Poena Damni trilogy both straddles and crosses perceived boundaries of literary form - from the journal-like prose in Z213: EXIT, to the elliptical monologues of the distinctly dramatic Nyctivoe, to the pared down poetic idiom in The First Death. Z213: EXIT provides the main axis for the narrative: from its description of the protagonist’s escape to a barren and distorted - but nonetheless real - world will emerge the grotesque ritual of redemption, enacted by the proles of Nyctivoe and, finally, the struggle of the mutilated hero on the island in The First Death. The Das Neue Ensemble - based in Hanover, Germany - is committed to contemporary music. Several new works have composed especially for the ensemble, many of them recorded and performed in many European cities. The ensemble organize thematic concerts exploring special topics and new musical trends.